Track your physical activities, improve your health, and stay in touch with friends and family while you do it! Interested in classic (or just plain old) cars? Does the thought of catalytic converters and emissions control make you shudder? Read on about my first car, a 1973 Karmann Ghia. 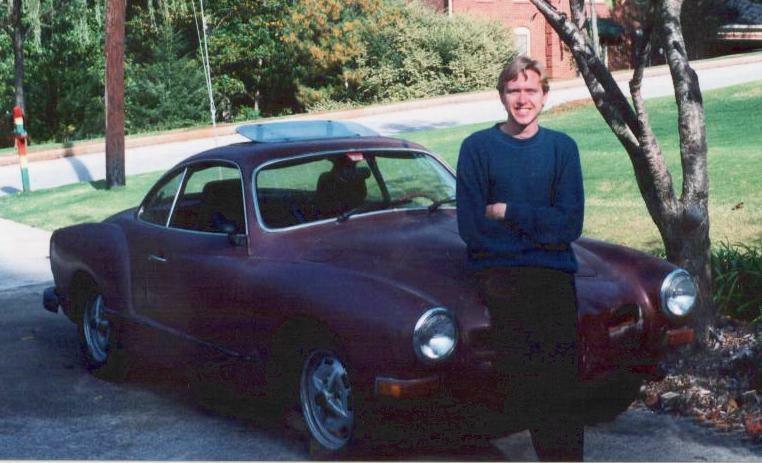 Whenever I'm forced to play those icebreaker games ( "...and tell something interesting about yourself..." ), I like to mention that I drive a car older than I am, a 1973 Volkswagen Karmann Ghia. Reactions to this statement vary from a nod of approval (or, at the very least, a nod of comprehension) to looks of utter bewilderment ( "You mean cars that old still run?!" ). Upon learning that I drove a Karmann Ghia, an acquaintance of mine became convinced that I was a Hare Krishna. To this day, I still don't see the connection, but if you do, let me know! The Ghia doesn't have any of those wussy safety features that are ubiquitous in modern cars: air bags, anti-lock brakes (or even power brakes), power steering, and the rest of that stuff. This car doesn't even have a radiator; it's air cooled. The lack of modern features doesn't necessarily make the Ghia any more dangerous. It just shifts a few more responsibilities onto the driver. And, as VW says, that's what farvergnugen (oh, I could never spell that - I studied Spanish, not German!) is all about... right? And just to prove that I'm not alone in loving my Ghia, check out the Karmann Ghia Club of North America.